Over the coming weeks we will be writing a series of mini-blogs that will focus on the various digital challenges facing traders of refined metals and concentrates and providing insights as to how we, as a software solution provider, teamed up with Concord Resources to solve some really complex problems and deliver ground-breaking functionality over this last 9 months. The basic principles of commodity trading haven’t changed for thousands of years: from as far back as 2500 BC you could trade forward contracts in Mesopotamia. So, whilst it is relatively easy to digitalise that vanilla transaction it takes much greater effort to increase efficiencies and to maximise the value for an array of organisational structures trading in various currencies across several time zones as is the situation faced in modern day trading. More difficult, granted, but not impossible as at Gen10 we have solved this with the aid of a highly powerful workflow engine. This tool not only allows you to define different automated rules and roles, approval levels, events and notifications, it will also ultimately maximise your trading and operation speed without losing track of your positions, and transforms trading and operations into a highly focused team effort where optionalities are notified and positions are reconciled real-time. As a former trader myself this control and automation is a dream come true! I don't know how often a macro changed in a spreadsheet and how much time was wasted trying to reconcile different sheets that were supposed to match but didn’t. As recently as 5-10 years ago in the early generations of CTRM, this level of accuracy was not possible nor perceivable but today it is and the precision and speed we bring to the screen is a whole new world. 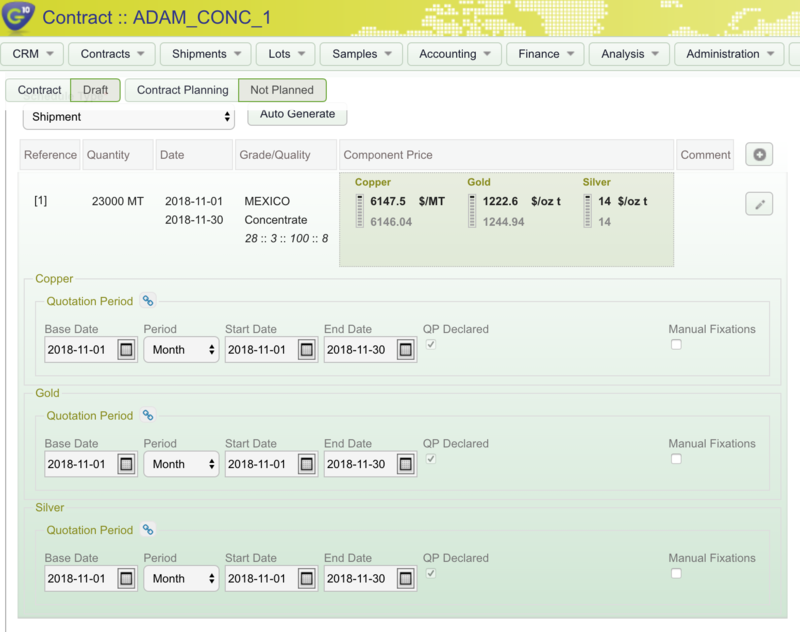 Gen10's Commodity Manager can bring it to you. 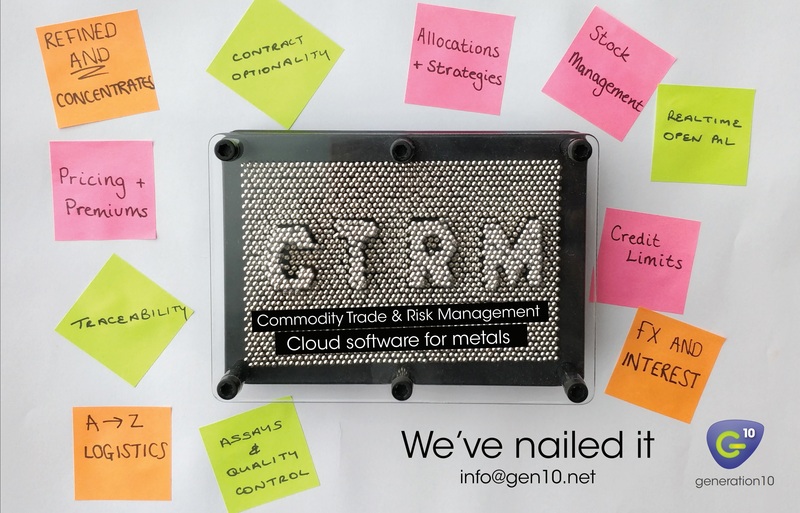 We are starting this first blog in the series by exploring the various requirements of Concentrates and Refined Metals trading that we implemented within Gen10 Commodity Manager to ensure that they gained the market and cost advantages they sought, both operationally and financially. Trading of concentrates such as copper, zinc etc tends to be very strategic and tactical as it involves complex details and parameters. It consists of multiple challenging, co-dependent steps that require an acute eye to ensure accuracy. Due to these complexities, trading is slower than that of their refined metals counterparts. Every little modification to tonnage, assay, escalators, R/C, deductions etc need to be amended precisely and expediently so that each other party involved, i.e. Logistics, Finance, can be notified to ensure they have the most up to date information to enable them to make the most informed decisions to efficiently undertake their roles. And this consistent attention to the minutiae is imperative on top of the daily workload which might include for Operations, for example: writing assay instructions and supervisions; hedging program; hedges and hedge corrections plus optionalities in shipping dates and tonnages. Not so easy to achieve a high level of success when processes are highly manual or disjointed. To support Operations with this necessity to improve accuracy and efficiency we provide standard email templates auto-populated with key information and alerting them to important tasks and deadlines with built-in reminders, which gives a new level of control for the whole team. It all becomes so much easier once you are suddenly ahead of the information game. Even when the backwardation comes, and deltas are hedged in advance, the impact on stress levels is minimal as positions are reconciled real-time and you know exactly where you stand. Refined metals on the other hand whilst still very tactical has fewer parameters making them faster to trade. Refined metals incur a much higher volume of contracts consisting of lots of different specs, instructions, hedges, trucks, containers and all this with different weights. Whilst a truck can carry 30 MT in Italy, it might be 27 or 28 in other countries. An LME lot stands at 25 MT and if you don’t adjust you will sooner or later end up with a speculative un-known position on LME or with the FX. The world is also full of volatility and our clients want to know that the interest calculations matches the actuals. Our system does that for you. From the PNL to the after-calc, we can run an audit log. Traders like Approved Counterparts and Credit Check. For example, if an invoice was paid this morning, there is room in the credit insurance for further trades. If credit is required but not available action can be taken to request payment or to open an L.C. Our clients can immediately assess the credit situation by just looking at the dashboard - a click away. Traffic/Ops like pre-filled forms, documents and emails. A Bank or Warehouse Release already contains accurate references and is available for instant checking to sign and execute, saving time, time that can now be spent on planning and getting more done, working better together. Contracts, Document Instructions, and Invoices are a readily available in the system if you want to check details or send at a click. Reminders on options and hedge dates or forward curve pricing are available. Finance and Risk like to see up-to-the-minute reliable exposure and activity with instant access and power of enquiry as to the status of transactions and supporting documentation/correspondence. They get automated updates as they become available which allows them to maximise the use of credit lines and to keep the cost down as they also get the maximum forward visibility. That visibility not only allows them to plan the lines but also makes a great impression to the banks - always fully aware of what is going on, the changes and the history. This can be done in real time by transaction, by client, by location exposure and at portfolio level > greater oversight and control when needed especially when markets are volatile and risk is highest. We will be going into more detail about how we manage Operational Risk later in the series. We bring significant productivity gains and reduce errors and operational risk by doing discrete standard tasks in an integrated system and workflow. A problem common to all traders in difficulty and complexity is that of keeping hedge positions and hedge programs correct and up to date. Reconciling the positions is time critical and we deliver this. Also with automated hedge programs and ever-changing transport schedules from the trader, to risk via ops and finance will know what is needed for them to make the team and its members to shine and look good. In both refined metals and concentrates, there is a lot of money, people and moving goal posts involved and it all needs planning and tracking. It’s very challenging and easy to appreciate the strains this puts on your systems and processes. At Gen10 we are very proud to be able to say that because of our underlying architecture and our crack-squad team, we have been able to address these challenges and have delivered a flexible and user-friendly solution on a single cloud-based platform that helps you scale your business quickly, efficiently and maintain control of your processes and cash. As we have all seen in other markets, once digitalisation takes a hold and automatisation starts, speed and prediction become so important that not doing it is a risk in itself. Concord Resources is one of our valued clients and we have collaborated with them to deliver the best platform and exact functionality they require. They are a truly impressive trading business and we are very proud to be entrusted to deliver this critical component of their trading activities. We’re all aware of the significant and often fatal result of IT disruption on global and national names such as Kodak, Schlecker and Blockbuster amongst others, and none of us can ignore the fact that we are now in a place where digital disruption of commodity trading will play a fundamental role in natural selection as the industry evolves. When you think of the efficiencies a robust CTRM system can deliver to you today, then you know it has moved from a nice-to-have to a must-have for companies large and small.